The BEST Oreo Cheesecake Recipe! Each slice is ULTRA thick, rich, creamy, and loaded with Oreo cookies! My love affair with cheesecake began in my early twenties, when I was a waitress at – wait for it – the cheesecake factory! I know a lot of folks who hate on that place, but if I’m being completely honest, I loved it. Heck, I still love it. I had a lot of fun working there and met a ton of great friends. And I also learned that I LOVE cheesecake. Sadly, I don’t have any top secret recipes or anything like that. But I do think a lot of my recipes are inspired by the ones I ate there years ago. Just take a little peak in the cheesecake recipe archive and you’ll see what I mean. There may be more cheesecake recipes on my blog than anything else! And there are MANY more to come. So I hope you guys love cheesecake as much as I do!!! But I digress! Today’s recipe for rich and creamy New York-Style Oreo Cheesecake was definitely inspired by my days slinging cheesecake at the CCF! Funny enough, the cheesecake factory Oreo cheesecake was not my favorite. But this homemade version is one best cheesecakes I’ve ever made! I think it’s because I used the batter for my tried and true New York-Style Cheesecake, and then just added a ton of Oreo’s! Because why mess with perfection, right? Oh, and I also added an Oreo crust. And some more Oreo cookies on top! 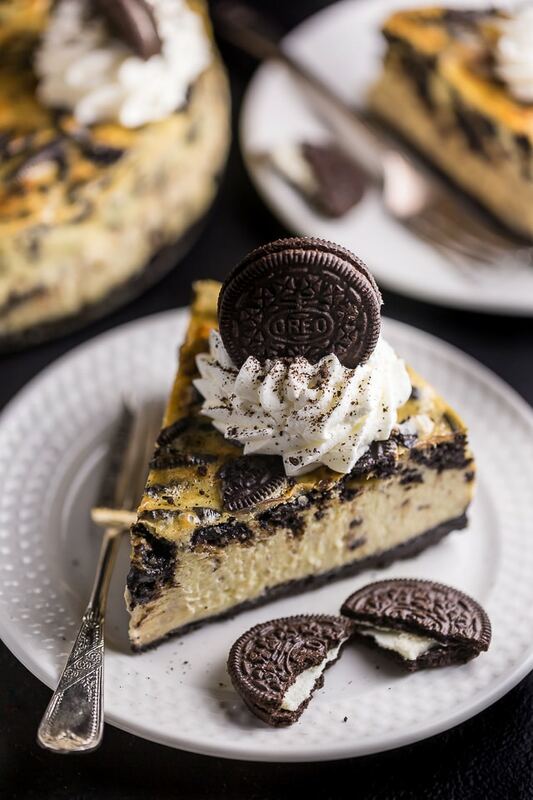 Because an Oreo cheesecake recipe should use as many Oreo cookies as possible, right? And if you’re interested in making this already decadent cheesecake even more sinful, try topping it with chocolate ganache. You can use this recipe. Before you begin, be sure to lightly spray the entire baking pan with non-stick spray. If you don’t have – or don’t use – canned sprays, you may grease the pan with butter or even shortening. Greasing the entire pan will ensure your crust and cheesecake don’t stick to the pan. No sticking = perfect slices. Because this recipe begins with the crust, that is also where we will begin. To make the crust you will need melted butter and crushed Oreo cookies. 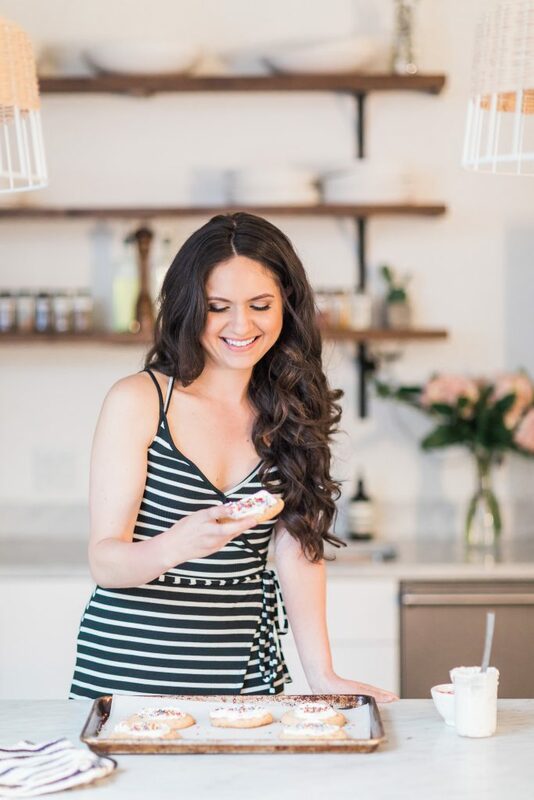 Yep – just two ingredients! You do not need to remove the cream from the center of the cookies. Simply place them in a blender or food processor and pulverize them into small crumbs. Once they’re crushed, you will combine them with the melted butter and then press this mixture into your prepared pan. And that’s that. You just made a homemade cheesecake crust! When pressing the Oreo crust down into the bottom of the spring form pan, you’re going to want to press it down very firmly. A firmly packed crust will bake up nice and thick, and most importantly, won’t crumble too much when sliced. I recommend starting to press the crumbs down in the center of the pan, then working the crust out and just a little bit up the edges. You can use the back of a spoon to do this, or wrap your hand in a piece of plastic wrap (also known as saran wrap) and do it manually. Room temperature ingredients are crucial when it comes to making a cheesecake! So be sure you bring your cream cheese, eggs, sour cream, and heavy cream to room temp before you begin making the batter. The batter can be made in a food processor, high powered blender, or add all of the ingredients to a bowl and combine with a hand mixer. I use my blender! It’s very important to beat the cream cheese and sour cream until smooth before adding the other ingredients. 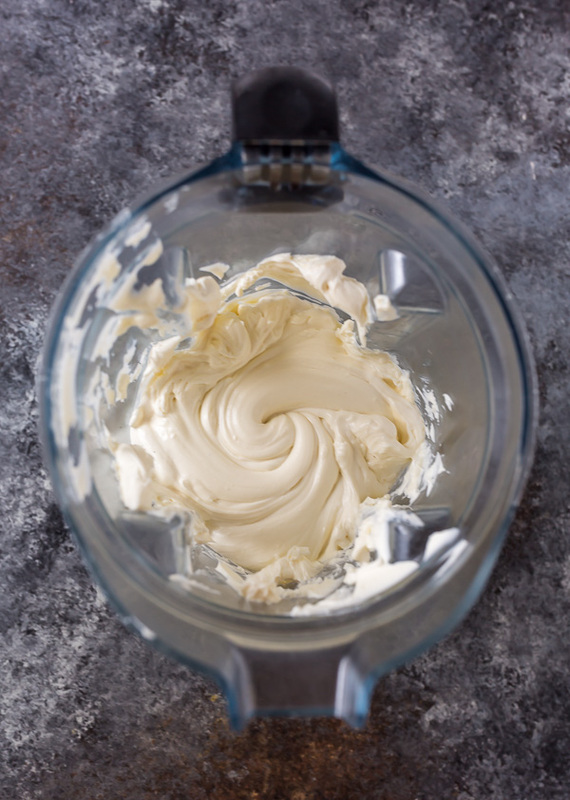 No matter what you use to make your batter, be sure to scrape down the sides of the container while you’re blending, so you don’t get “surprised” with lumps of cream cheese later. Once it’s silky smooth and lump free, you’ll add in the sugar, and then the eggs one at a time. Before pouring in the cream and then finally folding in the Oreo cookies. If you want an extra chocolate fix, you could also throw in a handful of chocolate chips at this point. But this is optional. And finally, we need to talk about the dreaded water bath. I say dreaded because I know so many folks fear making one or have had really bad experiences with them. But baking your cheesecake in one is a must if you want silky smooth, creamy, crack free results. My big tips here are to wrap your pan in multiple layers of heavy duty aluminum foil and to only fill the pan up an inch. And you’ll want to push the cheesecake into the oven very carefully, so that the water doesn’t move around too much. Many reader’s have told me they sometimes use a crockpot liner in addition to ensure no water gets in; I’ve never tried this but wanted to through the idea out there in case you want to give it a shot.If you’re not up for trying a traditional water bath – or just ran out of aluminum foil – you can place your spring form pan in a larger pan, and then place them in an even larger pan. Then fill that pan with a few inches of water. Does that make sense? 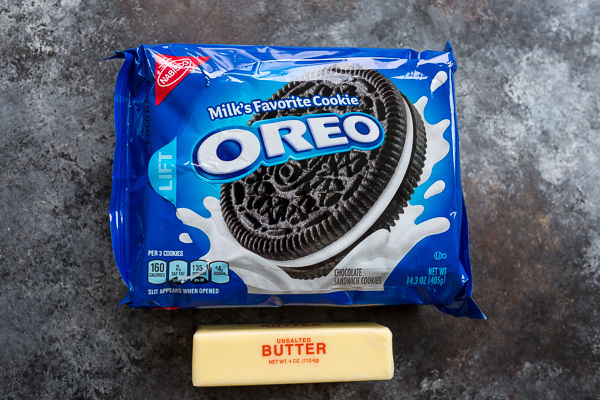 Once you’ve made your water bath, you’re ready to bake your oreo cheesecake! The baking time should be followed exactly to ensure your cheesecake cooks all the way through. So if the top starts to look a little too brown, simply cover the pan wit a piece of foil or parchment paper. When you remove the cheesecake from the oven, it will need to cool – in the pan – for at least 30 minutes before being covered and placed in the fridge to chill completely. You will keep the oreo cheesecake in the pan until it’s completely chilled. The remove the sides of pan and serve. 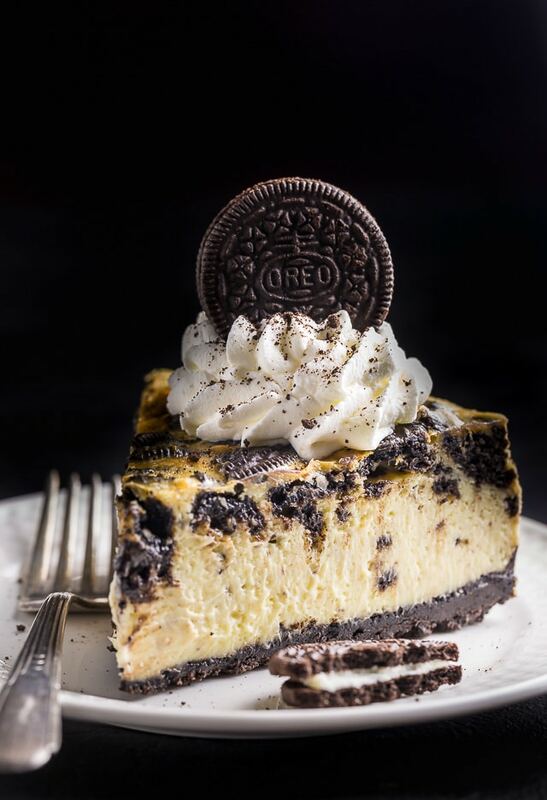 This Oreo Cheesecake can be baked, fully cooled, and frozen for up to two months! Making it a perfect holiday dessert option. Simply thaw the night before you plan on serving! And don’t be surprised when your friends think you bought this oreo cheesecake from a fancy bakery. It’s seriously that impressive! 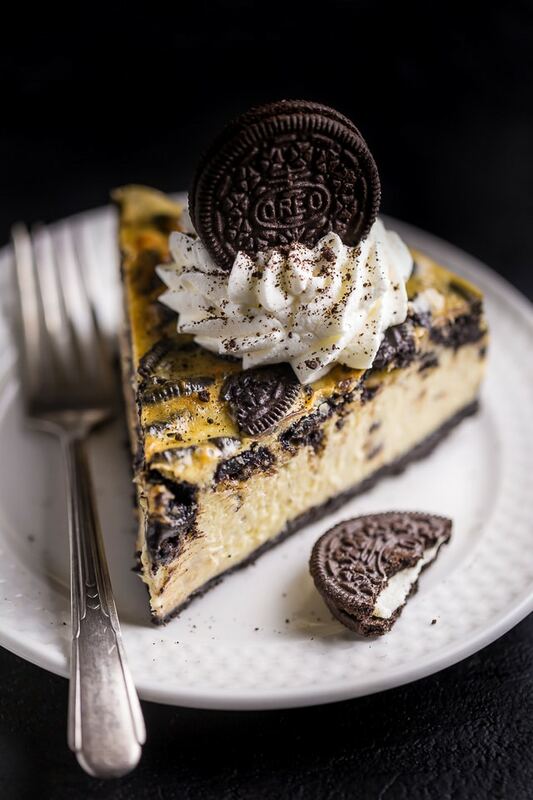 And if you try this recipe for New York-Style Oreo Cheesecake, let me know! 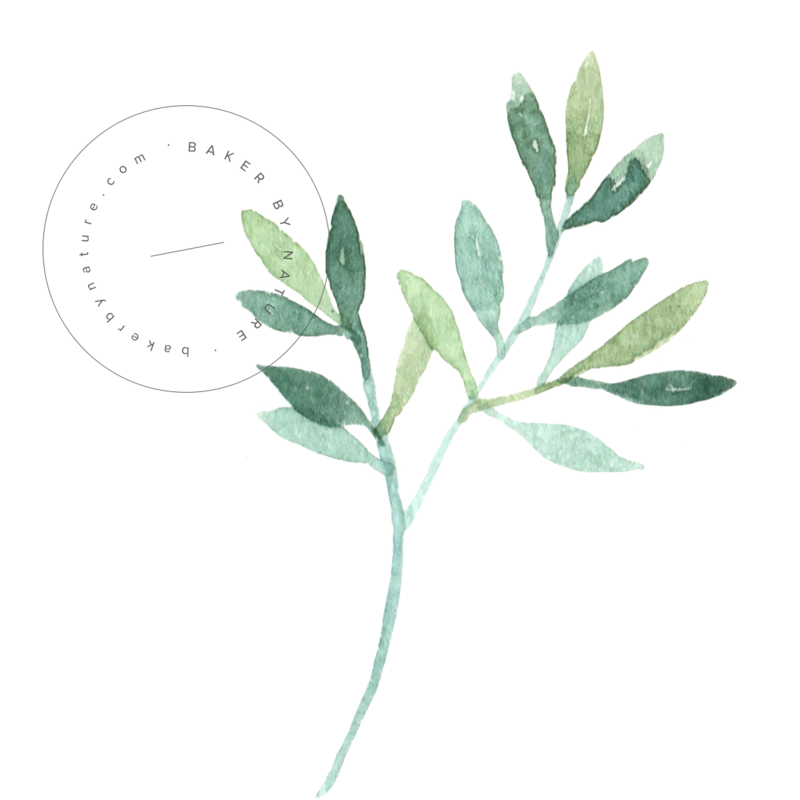 Leave a comment below and don’t forget to snap a pic and tag it #bakerbynature on instagram! Seeing your kitchen creations makes my day. 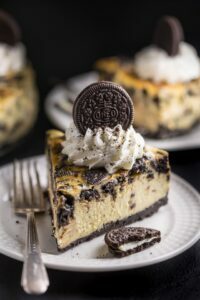 This ULTRA thick rich and creamy New York-Style Oreo Cheesecake is so satisfying and surprisingly simple to bake! Preheat oven to 325 degrees (F). Wrap a 9" spring form pan in multiple layers of heavy-duty tin foil. Lightly grease the pan with non-stick spray and set aside until needed. Place the Oreo cookies in the body of a small food processor - or blender - and pulse until the cookies are fine crumbs. Pour the crumbs into a large mixing bowl and stir in the melted butter; mix well to combine. Scrape the mixture into the prepared pan and firmly press the crust down the center of the pan and slightly up the sides. Bake in preheated oven for 12 minutes. Remove from oven and set on a cooling rack until needed. Add in the sugar and beat smooth. Add in the eggs and yolks, one at a time, beating well after each addition. Pour in the cream and beat just until it's evenly incorporated in the batter. Turn the mixer off and, using a rubber spatula, fold 3/4 of the chopped Oreo cookies into the batter. Pour filling into prepared crust and spread evenly. Sprinkle the top with remaining Oreo cookies. Place the cheesecake pan into a large, deep pan. Fill the pan up with 2 inches of hot water. This is your water bath and will help ensure your cheesecake comes out crack free. CAREFULLY place the pan in the oven and bake cheesecake for 1 hour and 20 minutes. If the top begins to get too brown, place a piece of tinfoil on top of the pan. Once the baking time is up, turn the oven off but allow the cheesecake sit, undisturbed, inside the oven with the door shut, for another 30 minutes. The cheesecake should be still slightly wiggly. Remove the cheesecake from the oven and place it on a cooling rack. Gently run a knife around the edge of the cake. Cool to room temperature, then cover the pan with aluminum foil and refrigerate for at least 6 hours before slicing. When ready to serve, top with a dollop of whipped cream and extra Oreo cookies. And enjoy! Ok, twist my arm! I’ll have a piece! This looks amazing! I want to make a 10 inch cake and double this. Any suggestion on baking time? This looks amazing! Do you think it be okay if I cut the amount of sugar in half? Will that change the recipe/cooking time? Thanks for your help! Can’t wait to make this! Oreos are always the best! I looovvvveee oreos!!! I can not wait to make this! Just made this and it is in the iven. However I also realized tge recipe did not call for vanilla extract! Was that a mistake or does it just not need the extra flavoring? How did it turn out without it? I am going to attempt it myself. Did you end up adding vanilla extract? I tried and followed everything and I think it lacks vanilla extract. Next time I’ll make it and add the vanilla in the batter. I just made this last week for my wife’s birthday and it was amazing. Cake was delicious and perfectly baked with a creamy texture and nice crunchy crust, and that is a testament to how well the recipe is written. All I did was follow your directions and it came out wonderfully. My only (minor) issue was I didn’t do a good enough job making sure the cream cheese was blended in, but when I poured the filling into the crust I just excluded the couple chunks and that seemed to work.